Many vandwellers, weekend warriors or alternative living advocates are outdoorsy and eco-conscious. So, at the back of every vanlifers mind is the amount of fuel their heavy adventure bus guzzles and the impact this has on the environment they love so much. Imagine being able to tow your off grid trailer using an electric campervan! Suddenly the carbon footprint of your adventuring has greatly diminished! Well, an electric trailer, which is made light enough by its own innovative electrical system, to be towed by any type of electric car is in the works by Dethleffs. Check Out This All Electric Trailer From Dethleffs! 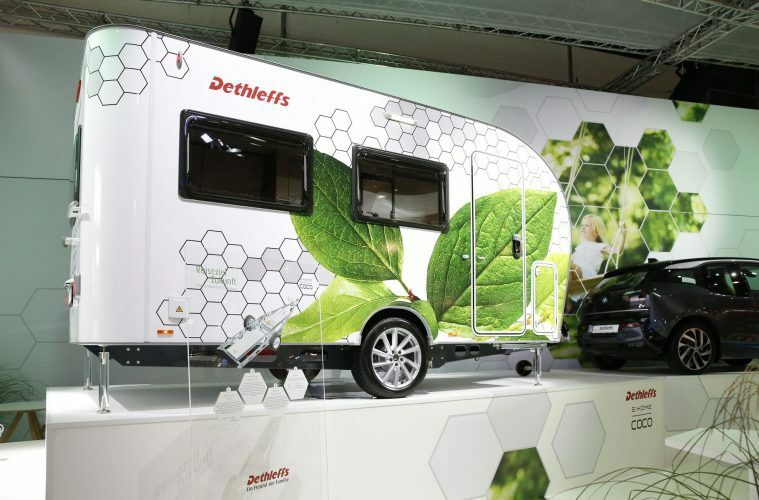 Dethleffs are a German camper manufacturer who has once before tried to minimise motorhoming’s large carbon footprint. Their first concept design was a motorhome wholly covered in solar panels to run all of the vans electrics, as well as a super efficient heating system. The tiny trailer that we’re looking at today, the E.Home Coco, is also affixed with solar panels, so this electric trailer is entirely self-sufficient. The sun charges the battery that is used for the movement of the camper and, once stationary, this battery can also power the internal features of the electric trailer. This means there’s no need to plug into the mains electricity at a campsite; this tiny eco house is good to go wild camping! But what does the battery on the electric trailer do? Traditional trailers do not have their own engine or power source as they are attached to your car. Well, the 80kW-h battery on this unique electric trailer sends power to the trailer’s electrified axle, which makes the electric trailer turn its own wheels, meaning that your car has much less work to do. Still confused? Put simply, the electric trailers manufacturers say that by adding the battery to the compact trailer, the weight your car has to pull would decrease by almost 90%. For example, if you’re towing one of their small travel trailers, weighing in at about 2000 pounds, the electrified axle, turning the electric trailers own wheels would decrease this weight to 220 pounds. Clever right?! This weight minimising feature would also mean that the fuel consumption of your car would decrease, compared to towing a traditional trailer. This isn’t just good for the environment, but your bank balance too! This E.Home Coco travel trailer doesn’t stop there. While this camper doesn’t look like it’s going to be an off road trailer, it can drive itself! That’s right, you heard correctly! This electric camper is taking us well and truly into the future! Once you’ve reached camp, simply disconnect your travel trailer from your (hopefully electric) car and use an app to manoeuvre your electric trailer into the perfect parking spot. This means you will be able to park your electric trailer in even the tightest of spots, which could be great for city camping or even just parking back on your driveway at your home base. This electric travel trailer is an ambitious project, but this eco-design is something so many people have been craving to see for a long time. It is refreshing to see a company thinking green and doing their part to minimise the pollution made by campers. 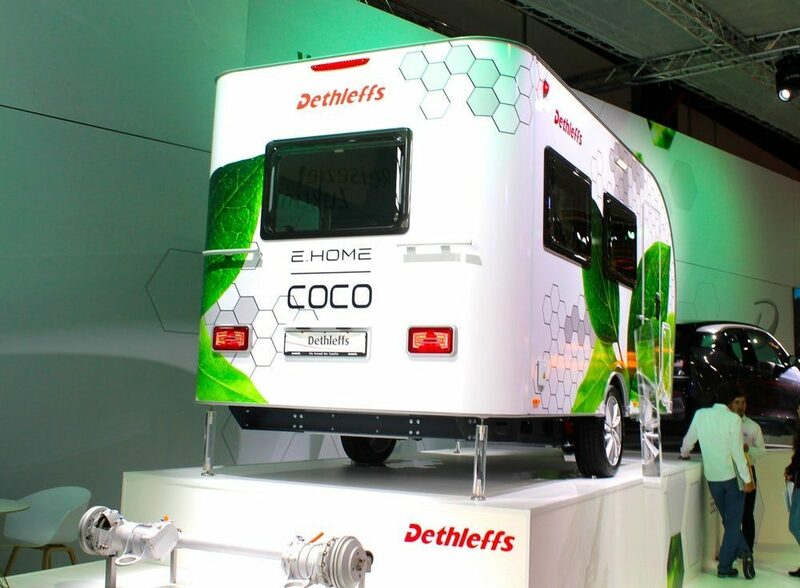 If Dethleffs can pull off and produce everything they have promised in the E.Home Coco, then this electric trailer could turn out to be one of the top eco campers on the market. 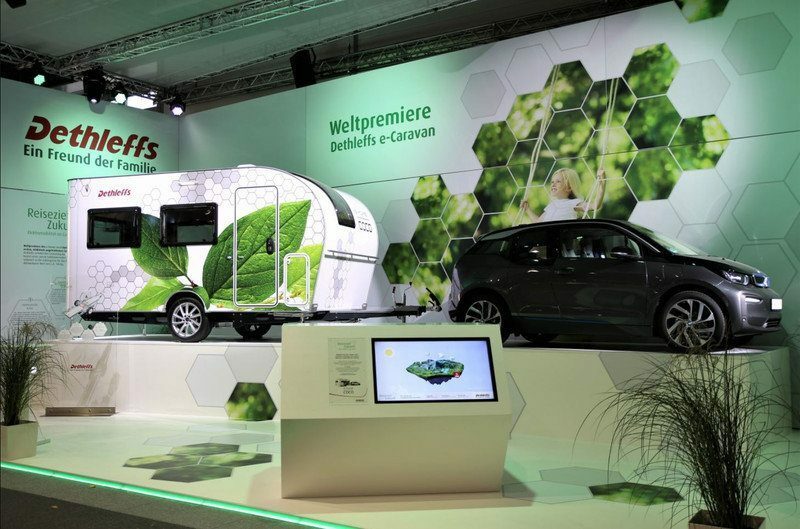 The electric trailer is currently in the concept stages and was first introduced at the Düsseldorf Caravan Salon last year (2018). Road testing for the is due to begin this year, so hopefully, we will see it appearing on the market at some point in 2020. At the moment this electric camper is simply a concept, so there are, of course, no interior design specs, no information as to the electric camper’s dimensions and no price indication. I imagine it will reach the higher price spectrum for trailers but the design is so innovative I feel like this is hardly worth mentioning. With this electric trailer, Dethleffs, are at least making an effort to go green and that is the most critical aspect. The exciting and original design has left me wanting to know more; I think it is a brilliant concept and if the finished product really does do what it says it will I think this could be the future of trailer camping. As an outdoorsy person, it is inspiring to believe that in times to come there will be the possibility of getting into the great outdoors, with a smaller carbon footprint. Like the sound of eco-living? These tiny homes will be right up your street. Fancy something with a bit more power? Check out this monster camper! Enter a whole new world of camping with the Caravanboat.